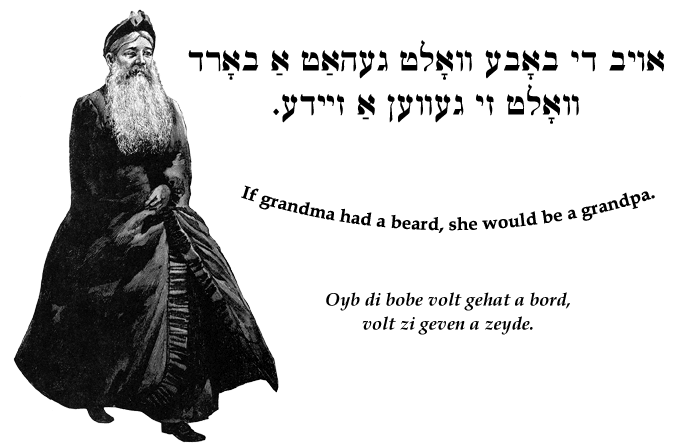 Yiddish Wit: If grandma had a beard, she would be a grandpa. Oyb di bobe volt gehat a bord, volt zi geven a zeyde. If grandma had a beard, she would be a grandpa. Ven di bobe zol hobn eyer, volt zi geven a zeyde. If grandma had balls, she would be a grandpa. Ven di bobe volt gehat a bord, volt zi gedavnt farn omed. If grandma had a beard, she would stand at the bima and daven. Literal translation: If grandma had a beard, she would daven at the cantor's pulpit (synagogue lectern).